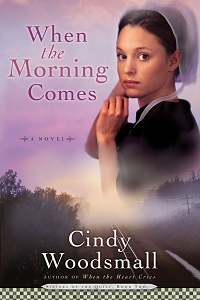 Toward the beginning of the When the Morning Comes , Hannah meets and receives help from a stranger of a different ethnic background. His reaction to her situation is much kinder than what she received from her own community. Can you name at least three ways in which his actions were Christlike? How would you respond to someone who looks as odd as Hannah did? As Paul deals with the aftermath of everything Hannah went through, he struggles with a desire for vengeance against her attacker even though revenge is against his beliefs. What does the Bible say about vengeance? Are there other Scriptures or biblical principles that you feel add a different perspective? Dr. Lehman doesn’t turn Hannah in to the authorities even though she is legally still a minor. Do you think he did the right thing by finding a way around the law in order to help Hannah find the freedom he believes she needs? Zabeth had been baptized into the Old Order Amish faith and later discovered a love for the forbidden musical instruments and “worldly” songs. She broke her vow and was shunned. Do you believe it is ever acceptable to break a vow? Is there anything in your life that would be worth losing your church, community, and your family over? Sarah is unable to bear the guilt for her part in what caused her sister to flee. It soon becomes evident that Sarah has deeper issues than just the jealousy. (That was apparent in book one, When the Heart Cries .) Has knowing only part of a situation ever caused you to judge a situation or a person unfairly? What steps can you take to avoid building a prejudice based on partial information? Is there a difference between judging a person and assessing him or her? If so, how can assessing be accomplished without leading to judging? Dorcas is not honest with Paul about Hannah’s efforts to reach him. Dorcas believes she is protecting him from a girl whose presence in his life would separate him from a relationship with his parents, his community, and his church. What separates protecting someone from manipulating someone? What are some warnings signs that indicate a person is aiming to manipulate rather than protect? As Hannah begins to build a new life, her emotions and desires are turbulent. At the end of book one she felt she had to leave Owl’s Perch, but after living with Zabeth awhile, she misses the ways of her people and their less stressful pace of life. Despite everything, she chooses to move forward with her new life. Our emotions constantly battle with us, and sometimes we follow our feelings rather than God’s principles. What are some steps you can take to make your emotions come under the wisdom and authority of God’s Word? Mary feels a heavy guilt about tricking herself into thinking she was trusting God when she was simply hiding the truth in order to get her own way. Has there ever been a time in your life when you tried to convince yourself that God’s will was the same as your desires? If so, how did you deal with the situation? What piece of wisdom would you share with children, young people, or loved ones to help them avoid making that mistake? After attending counseling sessions with Faye, Martin realizes that he has been blaming her for their mother’s death. What, if anything, could Martin have done to realize this earlier? Do you think it would have made a difference in Faye’s life if her dad and Martin had not blamed her? Have you withheld forgiveness from anyone in your life? Hannah believes that through counseling she and Martin can help Faye with her substance addictions and self-hatred. Regardless of Hannah’s efforts, Faye leaves, abandoning her children. Has there been a time in your life when you gave a situation your all and things still went wrong? How did you cope? What did you learn that might help someone else? When Faye abandons her children, Martin leaves a rich client in order to attend to the emergency, choosing family over work. Would you have handled the situation in the same way? Are the world’s temptations distorting what is really important in your life? After Hannah has rebuilt a new life for herself, she receives a call that her sister, who had betrayed her, needs her to come home. If you were Hannah, would you return to a community and family who had treated you so unfairly in order to help someone who had lied about you?